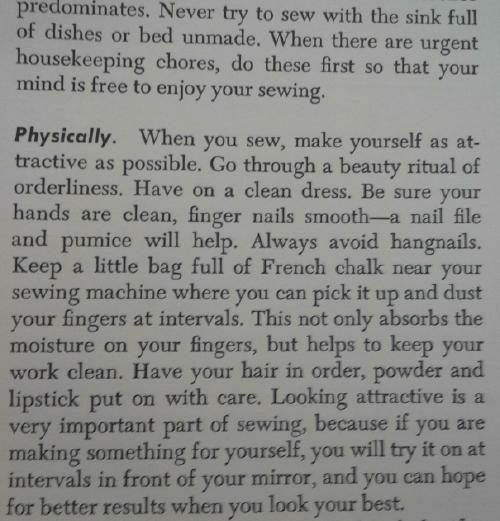 Rumor: Image reproduces women's housekeeping and grooming instructions from a 1949 Singer sewing manual. 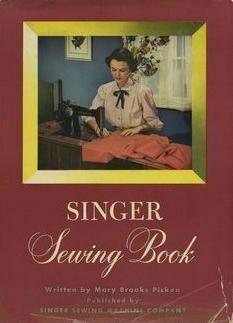 Claim: Image reproduces women’s housekeeping and grooming instructions from a 1949 Singer sewing manual. the expectation women should be unfailingly happy and industrious caretakers of their homes, husbands, and children — yet when we’re confronted with tangible expressions of those now-rejected attitudes from our past, we often skeptically reject them as being too ridiculous to be real. I’ve seen that [image] before too and I seriously doubt it. 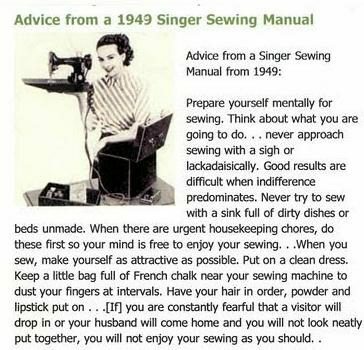 I have an old singer sewing machine, I’ve been sewing for quite awhile, and their “advice” tends to go along the lines of “Buy Singer oil for your Singer machine”, “Buy Singer parts to repair your Singer machine” and “Now that you’ve bought a Singer machine, don’t stop going into your Singer store to buy more of our products!”. The rest of the manual is — well, a manual. It tells you how to operate your machine, it doesn’t dispense helpful fashion advice. The Smithsonian has a lot of older manuals up [on their site] — it is for people like myself who have an older model and want to find out how to operate it. You can look through them but you won’t find advice on fashion. 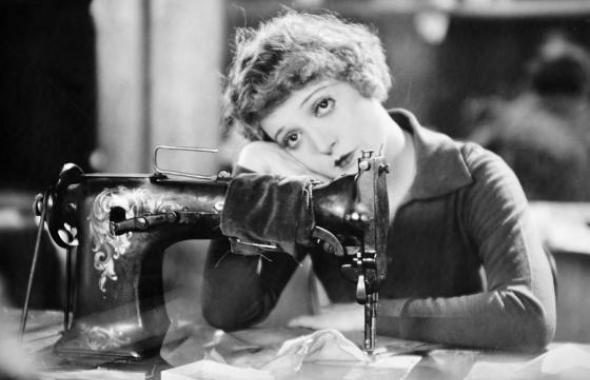 Never approach sewing with a sigh or lackadaisical attitude. Good results are difficult when indifference predominates. Never try to sew with the sink full of dishes or bed unmade. When there are urgent housekeeping chores, do these first so that your mind is free to enjoy your sewing. When you sew, make yourself as attractive as possible. Go through a beauty ritual of orderliness. Have on a clean dress. Be sure your hands are clean, finger nails smooth — a nail file and pumice will help. Always avoid hangnails. Keep a little bag full of French chalk near your sewing machine where you can pick it up and dust your fingers at intervals. This not only absorbs the moisture on your fingers, but helps to keep your work clean. Have your hair in order, power and lipstick put on with care. Looking attractive is a very important part of sewing, because if you are making something for yourself, you will try it on at intervals in front of your mirror, and you can hope for better results when you look your best. If you are constantly fearful that a visitor will drop in or your husband will come home and you will not look neatly put together, you will not enjoy your sewing as you should.